Tuesday night DJedi faced Paper for the first week of the playoffs. 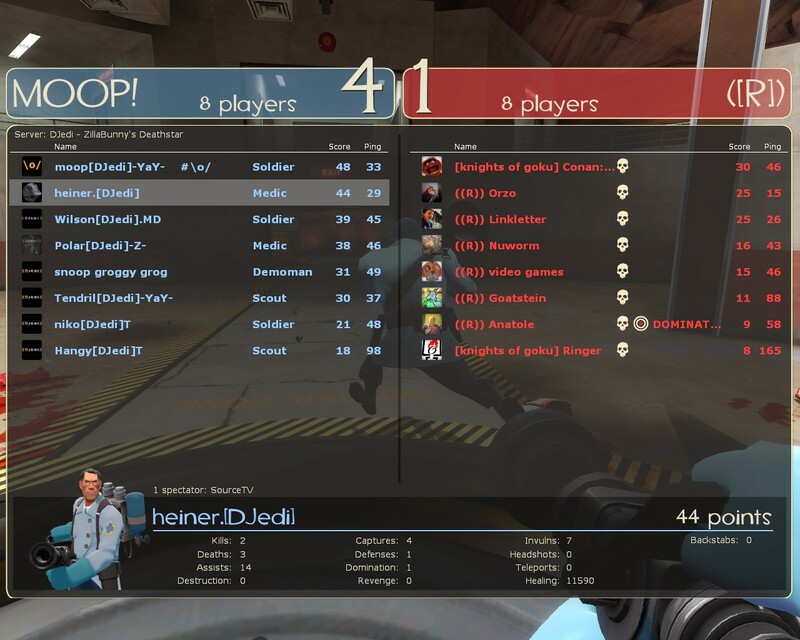 The round started out with a bang and Paper had us on our heels smacking us around with the kritzkrieg and a demoman. They pushed us all the way back to our last point but we persevered and were able to move out and push them all the way back to their last point. 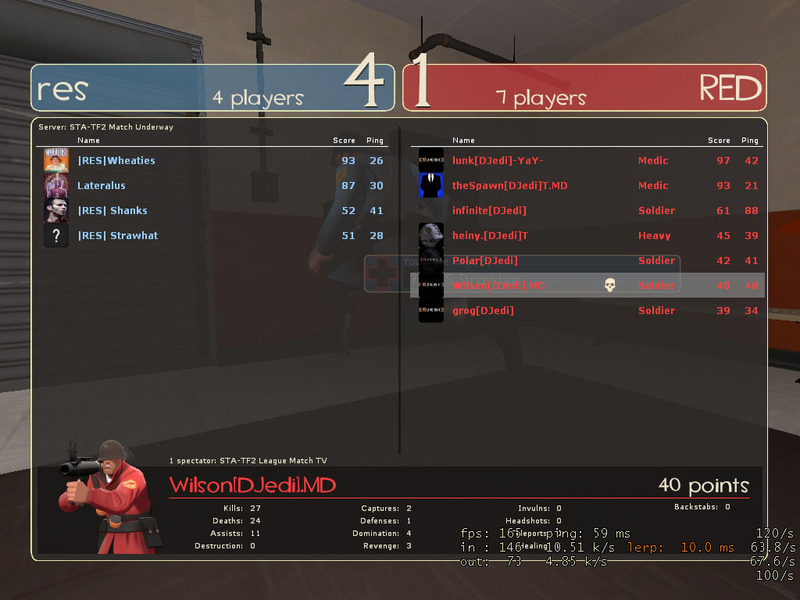 Tendril had some killer pyro runs that introduced a lot of chaos and as he was distracting them other team members would clean up. Great team effort all around, good games Paper. 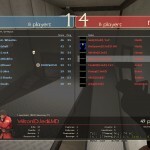 The following writeup, submitted by Heineken, covers a pre-season match against Random Shackers, now known as KBD on CP_Steel. This map has a steep learning curve, but after a few scrims we were able to pull it together. The round started off with DJedi playing defense. 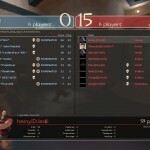 We decided to try some spy sneakery at A to get a medic. 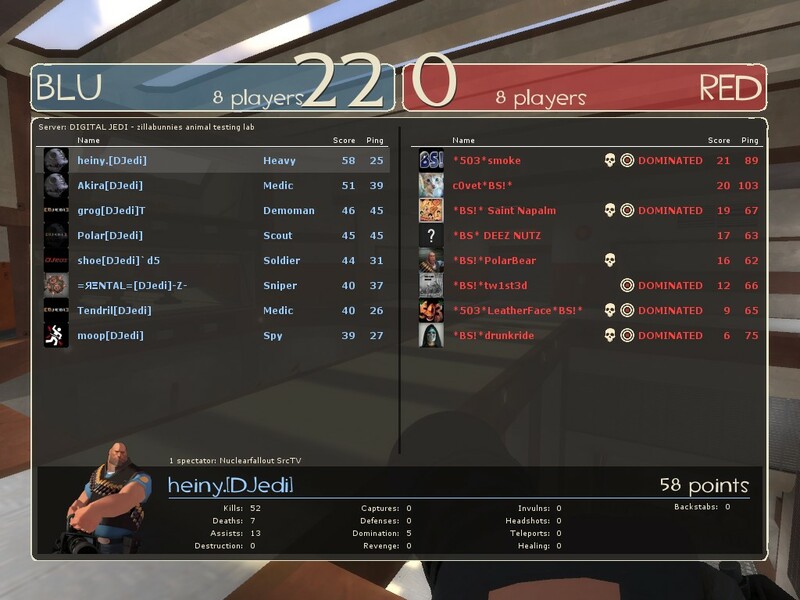 I’m not so sure it worked, but we also sent a demoman to take up some of their time. Polar was able to kill two of them right off the bat. He held them off for a minute or two and fell back to the rest of us at B. Tendril was our designated sentry gun professional and put it in the designated SG spot. After it went down twice (as he wanted) he went Soldier. It did a good job of forcing their ubers. He was able to keep it up against two seperate uber rushes (hw and then a demo). Slingshot as soldier and theSpawn as medic started the round off up high in B clogging the small hallway for them and dropped down when they flooded it. Heineken and theSpawn basically kept everyone as overhealed as possible, even though theSpawn was trailing behind Slingshot like a puppy because he needs a medic on him at all times (LOL!!!!). A spy snuck through and right as someone called “SPY AS ENGINEER! !”, hein got stabbed in the back losing one uber. That little sneak attack didnt do much to bust through the defense. They tried a few singular pushes to E, but grog as piper or Wilson as soldier would always go back and knock them to their doom. Our D was only really tested once when a lot of us were killed and they had 75% of the point. Right then everyone spawned, and heineken had uber and blew it blocking the point. Our 4 soldiers and 2 Demos flooded through and pushed them back. 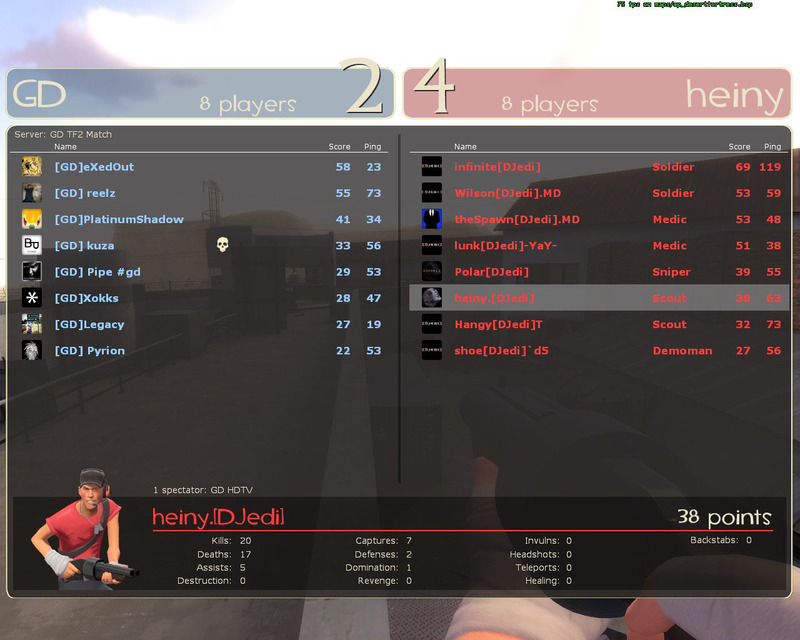 A couple DJedi ended the round with 1 death and many kills. Heineken went 2-1 thanks to that crafty spy! We watched for what they were doing at A and decided to push E hard and end it quick. There was no opposition at B so our demomen piped the oppropriate doors/spawns and soldiers got in place to block as well. Once this was accomplished our 2 scouts jumped onto the point. A few times they had to jump off. Grog and Polar did a stellar job of keeping them piped in, while the Soldiers kept them back with a constant stream of rockets. 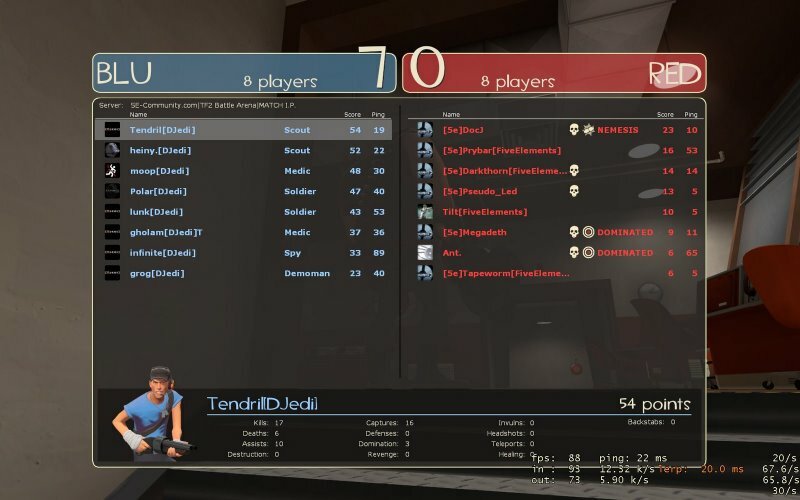 theSpawn followed the soldiers and demoman keeping them alive, while heineken stayed on the scouts keeping them alive from random rocket spray and pipes. We were able to cap the point without much of a hickup. I’m unaware if any DJedi died during the offensive push. All I know is that I (heineken) didnt get a chance to blow my uber all over Grog’s face so I am unsatisfied. 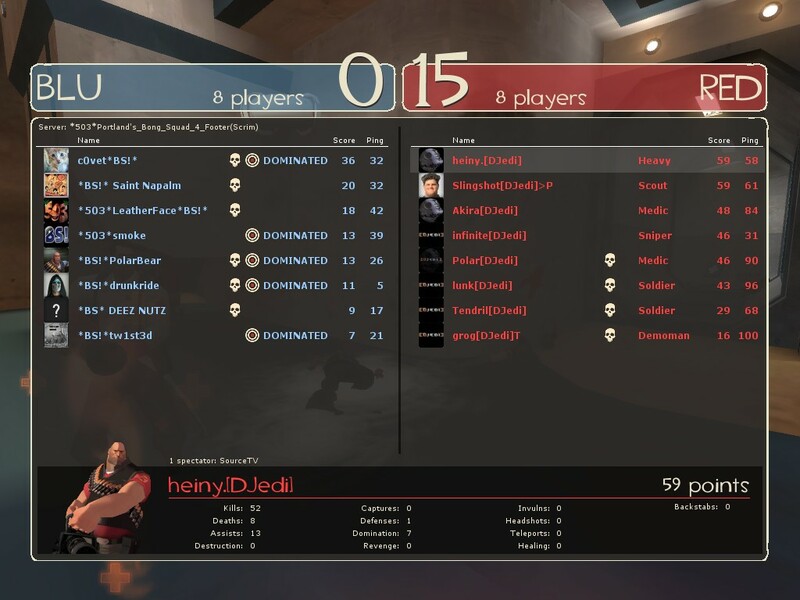 We started to play D again and were holding them at B for 4 minutes or so and then they decided they wanted to play on their West coast server where everyone pinged atrocious. At this point I had to drop in order to go to work. Otherwise….we would have had both rounds finished by the time I left for work. GG!! 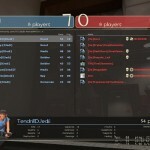 Tuesday night we faced off against FOoM for STA on Valve’s latest map, a remake of Goldrush. Things kicked off a little after 9:30 and DJedi was on offense first. We pushed out hard with uber and forced FOoM backwards from the gates. 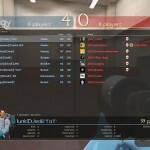 We focused on taking out their sniper, [FOoM]pwnoply, and the sentry that was stationed in the loft. After taking out these key defensive members we were able to focus on the cart and keep it constantly moving for most of Stage 1. Stage 2 was roughly the same, we pushed out and took out as many of their defenders with uber as we could and finally pushed far enough to get in range of their sentry. It gave us a bit of resistance but after taking it down we captured the cart and pushed into the second point of stage 2. Here we were met with some strong resistance but were still able to focus and take down their defense with the helpful cover fire of Polar[DJedi]. Stage 3 was much more difficult as we were able to push the cart almost all the way to the back point but were continually thwarted by FOoM’s two demo’s, sniper and engineer. Even with ubers we couldn’t kill enough enemies to cap the cart all the way and were held to 6 points on offense. Now it was FOoM’s chance to run offense and DJedi was to defend. After such a long round we had a few people who needed to go to work and had someone use the bathroom. All the while, the game was live and there was no break. When the gates opened we were not in position and were down at least 3 guys. FOoM stormed out of their base and made quick order of the first stage. After some adrenaline enhanced words everyone settled down and we sucked it up and got ready to defend Stage 2, this time with our entire lineup. Our gun was almost immediately spotted and taken down by an ubercharge. We held the first point as long as we could, but FOoM overwhelmed us and we moved to setup defense on the 2nd point of the stage. Slingshot took over as sniper and Polar moved to soldier, after first moonlighting as an engineer to help get the gun up. Our defense stood strong with the massive mowing power of infinite and the sharp shooting from Slingshot. 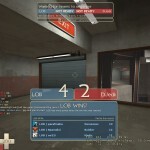 I would like to blame theSpawn for our offensive stop, his key saves on various players as medic, especially our sniper, was integral in our success. A short break later we were back on the server to start Round 2. This time DJedi didn’t fumble the defense and started with a full roster. Much as the same as last time though, FOoM rolled out and began pushing us back with ubers while someone hung back to move the cart. 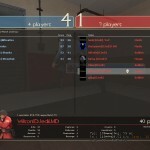 While we held them off longer than the last round of defense, we couldn’t stop them and they captured the first stage. This time for stage 2, FOoM kept the pressure on strong the entire round. We had to hold them back for a little more than five minutes and it was an epic struggle for dominance on both sides. For four minutes, both teams exchanged blows and traded frags until the 60 second warning. At this point both sides regrouped and FOoM pushed in with massive forces and blew multiple ubercharges. DJedi scattered to avoid death and countered with an uber-heavy to stop the cart and take out the cluster of people huddling around it. The last 30 seconds was as intense of a firefight as I can remember in any match and as the clock ticked down the cart was still inching forward. Finally, time ran out and FOoM had been stopped by the closest of margins. DJedi then took over on offense and in a replay of the first half, FOoM stopped us with 6 points as time ran out. What a great match, thank you for the intense games FOoM, you guys are always worthy opponents. Look forward to facing you again soon. 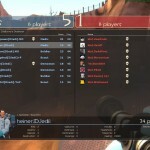 After defeating Resurrection in STA Play on Desert fortress, we faced off against them again for TFL. 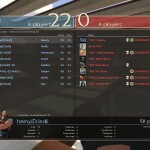 TF League has gotten super lazy to the point where they don’t even pick the maps for each week anymore, so it was decided between the clans to face off on cp_labor and cp_granary. 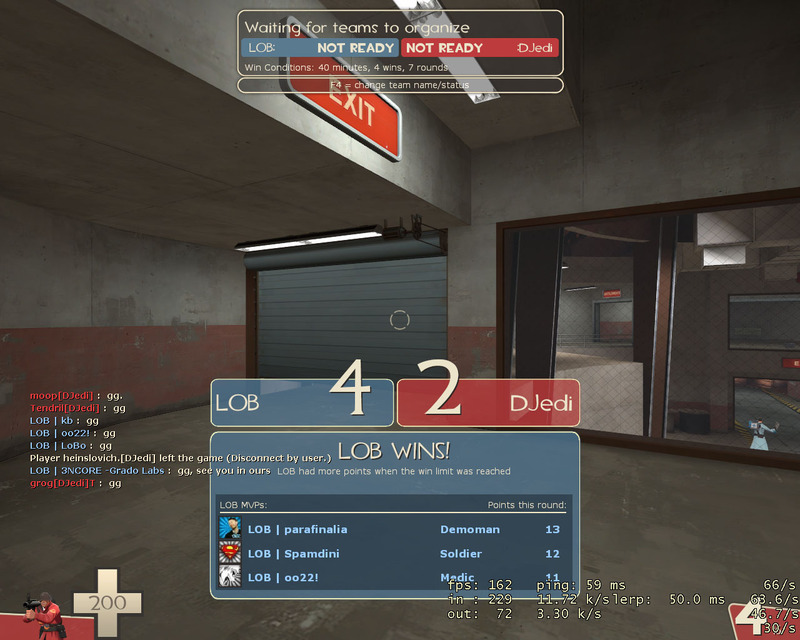 Thirty minutes into an extended wait for RES to get enough people, Round 1 kicked off on cp_labor, a DJedi favorite, and we got down to business. Not practicing the map as we should have |RES| caught us completely off guard and dominated the map in almost every way. By the time we got to the middle, there were already pipes lining the barn doorway which delayed our entry into the middle. That delay was all RES needed to claim control of the higher ground and capture the middle point. 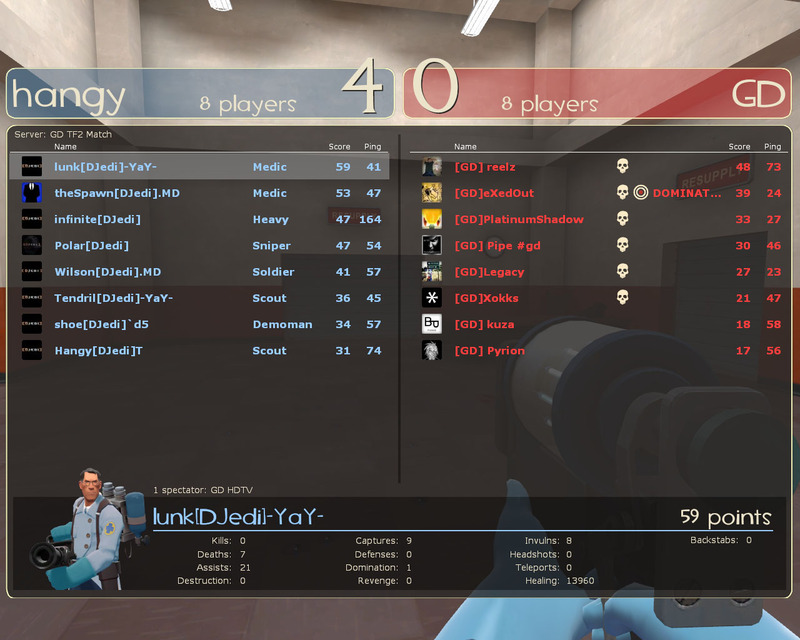 Typically DJedi has been able to push teams back on cp_labor, but not RES, not on this night. Our only shining moment came when during one push, grog was able to take out four members of RES with a single pipe trap and we pushed all the way to their base for our only capture of the round. 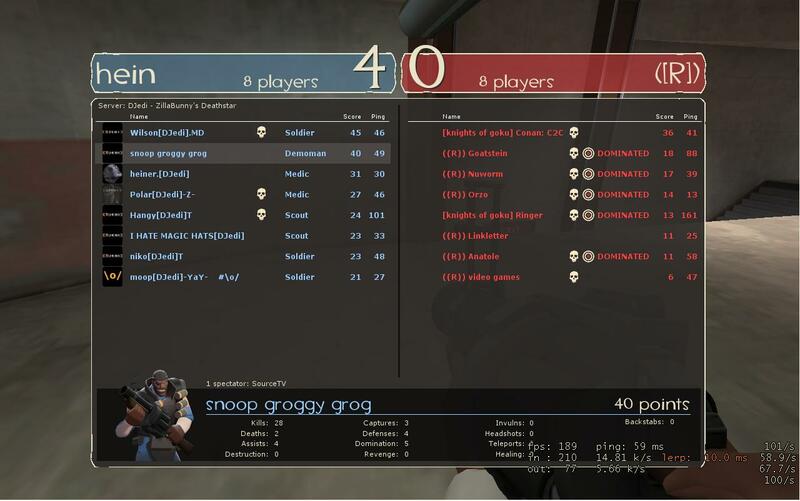 After a quick break and some lineup changes, bringing in Tendril and new recruit Hangman to scout it up, we got started on cp_granary. The gates that were introduced in the last update of cp_granary really help the flow of the game and make the battle for the middle much more fair and much more intense. 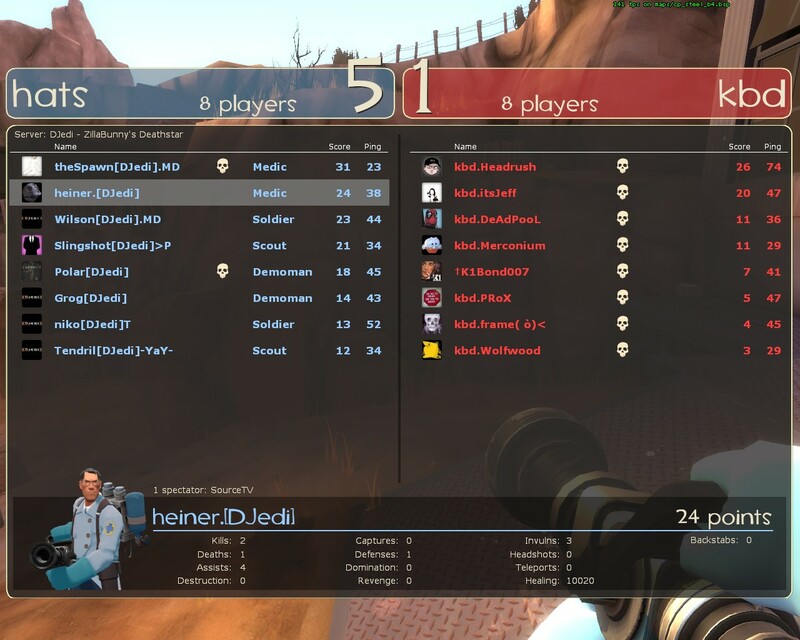 DJedi fought hard and was able to dominate the map for most of the round. 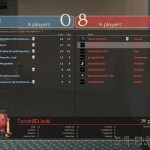 We were cruising to a victory and were up 3-0 for the round and tied overall. 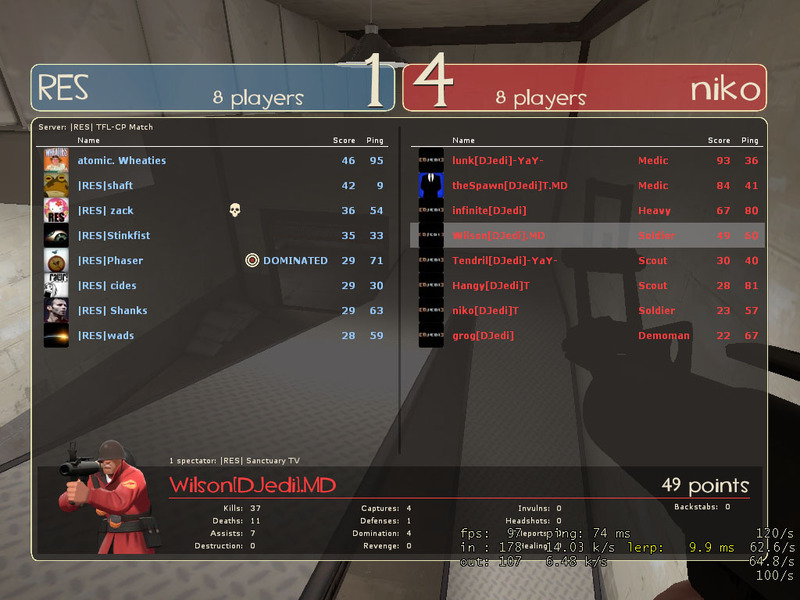 Then theSpawn[DJedi], hater of kittens and french kisses, jinxed us by saying, “This is the winning round guys”. 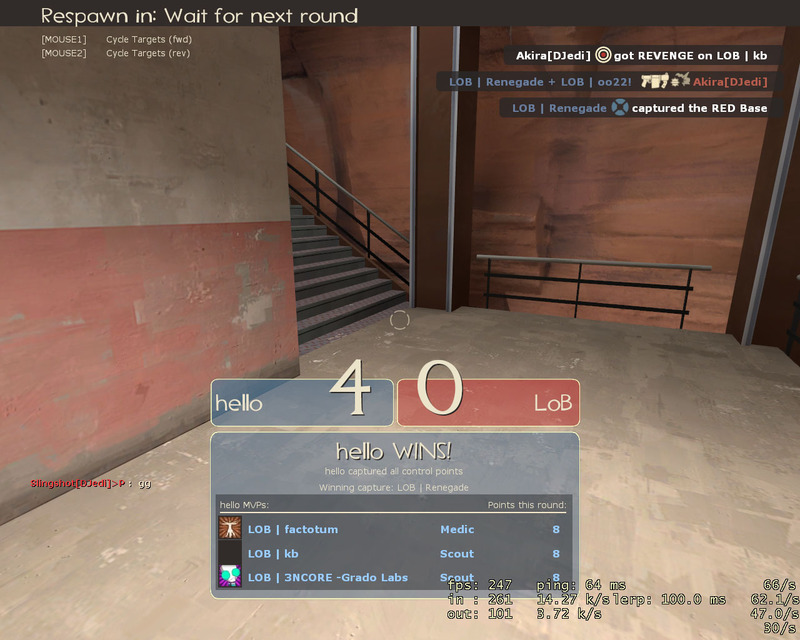 Needless to say, we didn’t win that round and gave up a capture to go down one capture overall and the round score was 3-1. We needed to work fast if we had any chance to win the match and we put our noses down and capped fast to bring the score to 4-1. We had a shot at getting one more capture, but the timelimit kicked in and the round ended. After an epic comeback in round 2 to tie up the game we ventured into overtime territory. 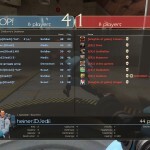 The leaders of the clan consulted with their respective teams and it was decided that the overtime map would be cp_well. DJedi had practiced Well even less than Labor and after losing the middle in the opening seconds of the OT round we were never able to regain control. RES was very efficient at pushing us back into our base and eventually captured on us. The emotional roller coaster of this match, from the empty feeling at the end of round 1 to the highs of our offense clicking during round 2, left everyone drained. While a W would have been the sweetest icing on the cake, our mistakes Round 1 proved to be too much to overcome. Amazing game |RES|, this will be a match to remember. Res also has a writeup of their own, but I think their math is a bit off. Tuesday, DJedi faced off against Ghosts of Darkness on Desert Fortress, a custom map with two middle points to keep the game interesting. Round 1 started off with a bang, GD had obviously done their homework and kept us on our toes. DJedi was able to score early after some hard fought battles to go up 2-0. GD was determined though and was able to close the lead with some precision sniping from [GD]reelz and full frontal heavy weapons guy action. GD was closing in on our lead at 3-2 and was on the verge of tying it up, but Hein and Hangy made the save by capturing B. DJedi pushed forward and won Round 1: 4-2 DJedi. For round 2 we switched Tendril in for Hein, whose new 3rd shift job is totally awesome. For this round we corrected some of the mistakes we made in Round1 and everyone played tighter and with more intensity the 2nd round. Polar’s sniper rifle was on fire and his cover support held reelz and GD down while the rest of DJedi moved around the map. Communication and teamwork really came together and were able to execute our strategy at a high level. Round 2: 4-0 DJedi. Great game’s GD, we look forward to our next battle. After spending sometime trying to get a hold of anyone from clan Machines Least Wanted, we thought that we were finally going to get a forfeit win. After my previous post and hearing many tales of woe with clans getting forfeit wins wasting a lot of scrimmages and practices, we thought we were finally have it happen to us. Nine forty five rolls around, and the DJedi guys are on the server getting down, warming up, finalizing positions and strategies. Looks like a forfeit win, a Thursday night ruined? Well, we did some looking around and mLw has a total of nineteen people on the roster so we had hope. Just as the forfeit was about to go down, the first of several mLw guys joins the server, first in comes mLw-NotActuallyThere, and quickly followed by mLw-noShow and mLw-ForfeitHat. So with everyone on the server the match was ready to get going. 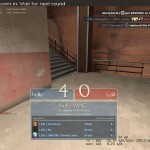 So a big thanks to [TF2F] for not wasting my Thursday, and the practice we put into the map, it is sad to see more and more teams forfeiting, but it is almost worse that these people are not communicating with admins and informing them that the clan is defunct, which may have allowed for us to reschedule with a clan that actually wanted to play. Not much to say about our first CAL match that the screenshots don’t say for themselves. Round 1 found DJedi venturing to the far left coast to a server in Portland, OR. 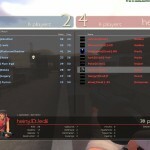 Even with the major ping disadvantage our teamwork still triumphed and we took round 1. For Round 2 we moved to our NuclearFallout server in Chicago and with a few lineup changes we pulled out 22 more captures.